With many painters, a brush is no more than "a stick with some hair on it" said Jamie Wyeth. It is just a carrier of paint onto the painting surface. I do not have fear of the brush in situations where a painting can be adjusted any time. I do not criticise other medium but try to say what it is that a watercolour painter has to face, the fear of a little brush! the brush that leaves unadjustable marks on a sensitive unforgiven pure white paper surface. What if I make mistake? What if I make wrong judgement? What if I loaded too much paint? What if I loaded too much water? What if the paper dries out before I could do anything? What if the paper buckles up? . . .
On top of that is the desire to achieve clarity, spontaneity, transparency, flawless, effortless, simplicity, mood, tone, accidental, poetry.. The desire to make a thoughtful move with carelessness, the thrill of a fleeting moment. The desire to make the difficult looks easy. The list of desirable quality of a good watercolour goes on and on.. The longer the list the more fear it creates. There's also fear to see our own limitation. Ah! on top of that is the quality that watercolour purists insist. I would not include it here because I think I would need another post for it. 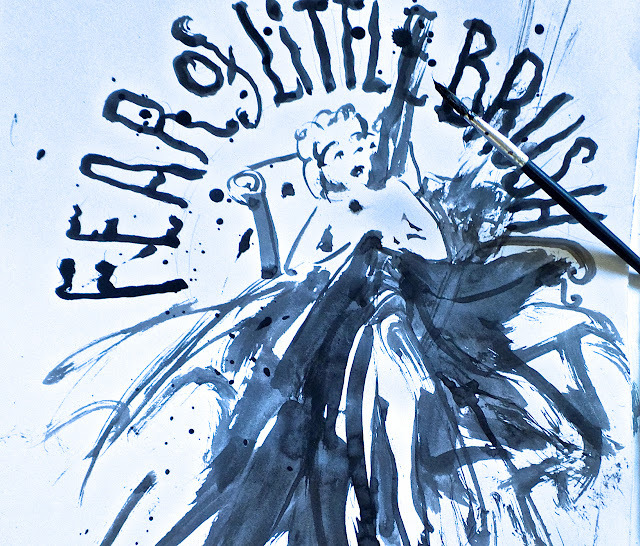 Fear of little brush is the reason I practise! I practice to know and to make friend with it. Some brushes are more difficult than others but I think if I practise enough, the brush will start talking to me! Good watercolour is unpredictable. The brush also has its own mind and personality. When working en plein air, random wind, rain, heat, cold.. in the environment add to the challenge... so often I leave the control to the elements. Sometimes, I just run! Here is a little secret. Behind the fear of the little brush is my excitement of discovery. No matter how much I practice, the little brush retains her mystery and endless possibilities.